How about a breakfast treat that you could practically eat for dessert (and I would actually encourage that!)? Yes? 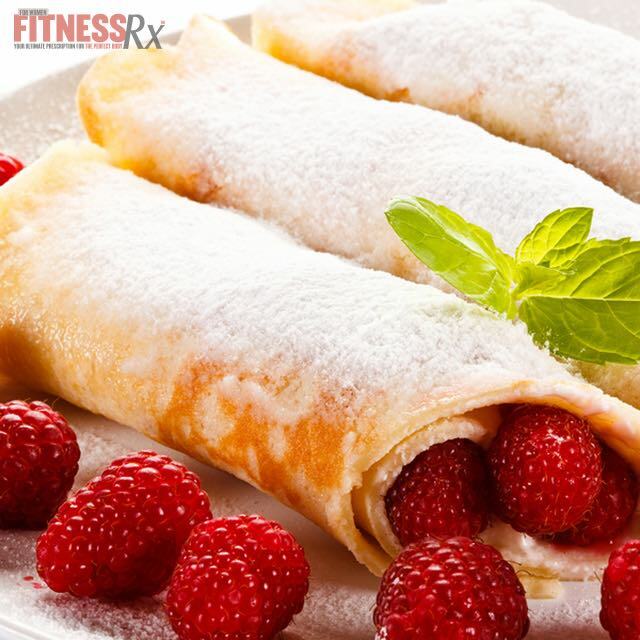 Well, my Raspberry n’ Cream Crepe Rollups are just what you need then. They are sweet enough to eat for dessert, but are also packed with protein to help fuel your day as a breakfast treat. You can prepare the rollups the night before or make a couple at a time so you have them to just grab and go. The protein crepe is wrapped around a creamy yogurt and blueberry filling for a well-balanced meal to get you going and/or to satisfy that sweet tooth at night. What’s even better? Each full crepe has only 250 calories and 3.5 grams of fat, with a whopping 40 grams of protein and 6 grams of fiber. Get to the kitchen folks and make that tummy happy! 1. Put whites, protein powder, water, vanilla and cinnamon into a blender. Blend until smooth. (if you don’t have a blender, you can use a whisk but be sure to blend very well until batter is completely smooth). 2. Coat 10’’ skillet (or larger) with non-stick cooking spray and put over medium-high heat. 3. The KEY here is technique!! Pour the batter onto the skillet and swirl all around to cover the bottom of the pan in a very thin layer. After approximately 2 minutes, or once it starts to bubble and bottom is golden brown, flip crepe over and cook for an additional 30-60 seconds or until underside is golden brown. Repeat for remaining 2 crepes. Put crepes onto plate and let cool for a few minutes. 4. While the crepes are cooling, mix the filling by combining Greek yogurt, vanilla protein powder, salt, and sweetener in a bowl and mix well until nice and smooth. 5. Divide mixture and spread evenly onto each of the cooled crepes. Next, divide the raspberries and place on top of the filling. Grab one end of the crepe and gently fold and roll firmly with your fingers to create the rollup. Repeat for the remaining 2 crepes. Let sit for a few minutes to set. Enjoy!